Tokyo, Japan (April 4, 2019) - An exciting dining and recreational space has opened on the site of the Yanmar Offices in Tokyo. With the Yanmar offices that previously occupied the central Tokyo location leveled and slated for reconstruction, THE FARM TOKYO which features a beer garden and bakery café is scheduled to run on the site from April 5th, 2019 to October 31st adding a splash of greenery to the prime location. Yanmar, widely known as a manufacturer of highly efficient labor-saving tractors, agricultural machinery and agricultural solutions, has in recent years also branched out into the food sector, connecting producers with consumers and creating new value in food through its Premium Marché activities; from opening Yanmar’s headquarters staff cafeteria to the general public, to producing and selling Premium Marché branded Yanmar original foods on its e-commerce site. 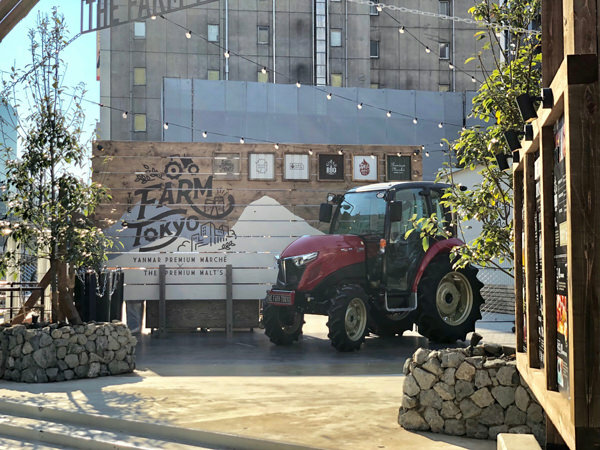 THE FARM TOKYO will play host to the display of Yanmar’s latest tractor, the YT357AJ, while Yanmar original smoothies and soft-serve ice cream made with Rice gelée, a special ingredient consisting of just rice and water will be available at the Premium Marché Shop, open for a limited time only at the site. Visitors will be able to barbeque and grill from a menu of specially selected Premium Marché foods, all the while enjoying the ambience of food, nature and great company in the very center of Tokyo. Open for a limited time only at THE FARM TOKYO, the Premium Marché Shop has a range of original, healthy deserts where the actual producer of the ingredients is introduced to the consumer by photograph for the ultimate in safe, delicious food. A delicious healthy vegetable smoothie, a soft-serve ice cream, and Rice geleé – a versatile gluten-free ingredient made entirely of rice and water, are already available at Premium Marché OSAKA, the staff cafeteria at Yanmar headquarters, and will also be available at THE FARM TOKYO. A range of Yanmar original goods including a miniature of the tractor on display at the venue, a limited edition Premium Marché tote bag and individual or commercial sized packs of Rice geleé will also be on sale. THE FARM TOKYO features a special menu of selected Yanmar original products and Premium Marché select ingredients for the grill, with a wide range of drinks, pizza, and bread also available. The sausages and garlic sauce use Yabu Garlic from Yabu in Japan’s Hyogo prefecture, an area where Yanmar has supported the development of the agricultural industry. “Yanmar Special Rice” from Tottori prefecture as well as pizza and bread made from Rice geleé are also available. Featured drinks include a popular Japanese beer: The Premium Malts, as well as a collaboration under the concept: FARM TO BEER of “Green veggie and apple beer”. A Yanmar YT357AJ tractor is on display inside the grounds of THE FARM TOKYO. The model which is targeted at the top end of the pro-farmer market, went on sale in December 2018. The model manages to incorporate both a modern form and comfortable operation in a stylish design from renowned industrial designer Ken Okuyama. The head-turning tractor is sure to evoke pride in its owners and inspire a new generation of farmers into agriculture. The display of this latest in agricultural equipment offers visitors to THE FARM TOKYO the chance to snap a picture with it for social media.